A complete denture may be either “conventional” or “immediate.” A conventional type is made after the teeth have been removed and the gum tissue has completely healed, which usually takes four to six weeks. During this time the patient will go without teeth. Immediate dentures are made in advance and immediately placed after the teeth are removed, thus preventing the patient from having to be without teeth during the healing process. 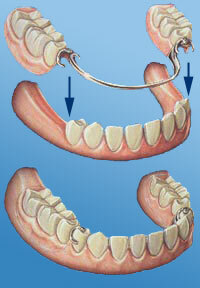 Once the tissues shrink and heal, adjustments are made to the denture. Dentures are very durable appliances and will last many years, but will have to be remade, repaired, and adjusted due to normal wear.